Are you in need of anchors or anchorage connectors? Come see our line of fall protection at National Ladder & Co. where we have a wide range of products for all your project equipment needs. 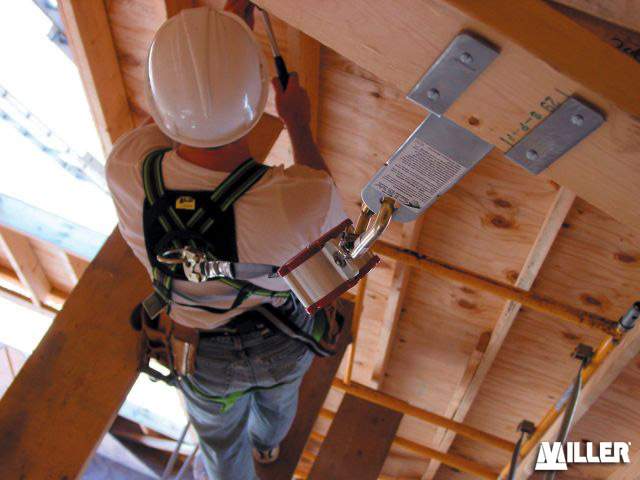 We are proud to offer Miller’s line of fall protection products, including their anchors & anchorage connectors. Miller is known for their product being durable, strong and safe. Miller’s fall protection products provide safety for your employees as well as the mobility and easy movement that they need to get work done. Their anchors & anchorage connectors are no exception to this. With units built to hold 3,000 to 5,000 lbs., these products are sure to handle even the most difficult jobs safely. The strength and durability of these products make them withstand the harshest of conditions. National Ladder & Scaffold Co. is a family operated business and has been since our opening in 1935. We offer a wide variety of products for all your project needs, which you will be able to find at the lowest prices available. We have two locations in Michigan and an online store, so it is easy to order from us from anywhere or anytime. We also are available to ship anywhere in the U.S. while still having some of the best shipping options available. Come order from our online store where you will find our line of Miller anchors & anchorage connectors as well as other fall protection products that will fit your needs. If you order now, you will receive FREE shipping on any fall protection purchase. If you have any questions concerning your order, please contact us at info@natlad.com or call us at 1-888-725-5995.